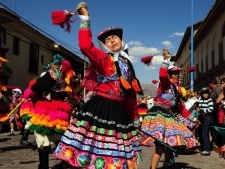 Noble Journeys offers outstanding Peru travel opportunities. Thousands of years before the famous Inca, highly-developed cultures thrived here, long before the arrival of Europeans. Stunning remains have been discovered – Chan Chan, the largest adobe city in the world, The Lord of Sipan's burial site containing fine examples of pre-Columbian jewelry, textiles and pottery, other burial sites near Lake Titicaca, and of course mystical Machu Picchu; new discoveries are reported frequently. The enigmatic Nazca Lines, etched into the wind-swept desert floor, continue to puzzle scientists and fascinate travelers, as do the walls of tightly-fitted huge stones, with no mortar, which figure so prominently in Inca ruins. Lake Titicaca is home to the Uros people, living on floating islands and crafting their homes from the reeds in the lake. The bloody Spanish conquest of the 1530s did not succeed in destroying the ancient cultures – they are still very much alive. 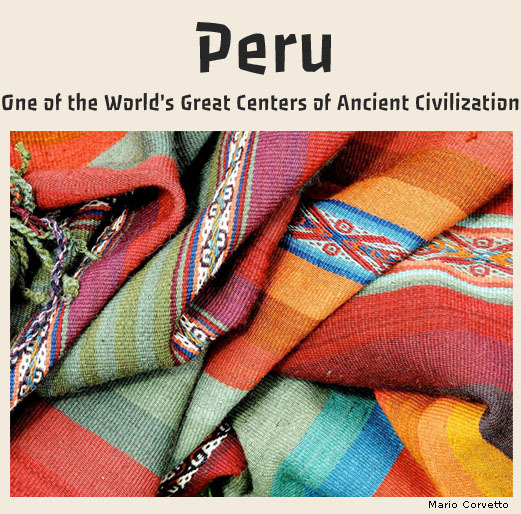 Half of Peru's population still live in remote Andean villages and still speak the language of their ancestors; they continue the ancient crafts, particularly textiles, some of the best in the world. Ceramics were prominent in the ancient cultures and are still produced in various villages using the original techniques. Noble Journeys' Peru tours can take you through breathtaking landscapes – from the soaring Andes Mountains to the coastal desert, the driest place on earth. Cusco is the oldest continually inhabited city in the Americas; beautiful Arequipa, the "White City", gateway to the Colca Canyon, twice as deep as the Grand Canyon, and Lima, the capital, offering unexpected treasures among the bustling street life. The Amazon River and many tributaries contribute to the lush rainforests and cloud forests, filled with colorful birds – macaw and parrot licks are wonderfully raucous, giant river otters play in the rivers, capybara, monkeys, tapir and even the elusive jaguar may be spotted. There are marvelous museums and private collections of art, ceramics, finely-crafted gold and silver to be visited, and delicious meals to savour. Lima is now one of the gastronomic destinations of the world. From upscale hotels to simple lodgings, the traveler has many choices. As you can see, the question is "where do I begin?" This is a country deserving of return visits – our Peru tours offer endless possibilities. Or Create Your Own Experience: call us to discuss what you'd like to do, and when!